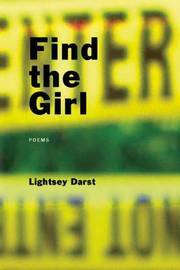 "Find the Girl is a book of poems as urgent as its title. . . . Here we have an important new poetic voice, one that fully earns Louis Zukofsky's observation that, in poetry, 'The story must exist in each word or it cannot go on.'" --Laura Kasischke, author of The Life Before Her Eyes From Snow White to the Yde Girl and Helen of Troy to JonBenet, this lurid and lyrical debut explores the transition from girlhood to womanhood and America's almost pornographic fascination with missing and exploited children. Originally from Tallahassee, Florida, Lightsey Darst is a writing instructor, dance critic, and dancer who lives in Minneapolis where she curates a writers' salon. The recipient of a fellowship from the National Endowment for the Arts, her poems have appeared in the Antioch Review, Diagram, Gulf Coast, Monkey Bicycle, New Letters, and elsewhere. Find the Girl is her first collection.